Steid o the Kharga Oasis in Egyp (lawer center). El-Kharga' (Arabic: الخارجة‎ al-Ḫāriǧa), an' a' kent as Al-Kharijah, (meanin the ooter oasis) is the soothmaist o Egyp's five wastren oases. It is locatit in the Libie Desert, aboot 200 km tae the wast o the Nile valley, an is some 150 km lang. It is locatit in an is the caipital o the New Valley Govrenorate. This oasis, which wis kent as the 'Soothren Oasis' tae the Auncient Egyptians, is the lairgest o the oases in the Libie desert o Egyp an "consists o a depression aboot 160km lang an frae 20km tae 80km wide." Its population is ower 100,000. Kharga is the maist modrenized o Egyp's wastren oases. The main toun is a heichlie functional toun wi aw modren facilities, an virtually nothing left o auld airchitectur. Awtho framed bi the oasis, thare is nae oasis feelin tae it; unlik aw ither oases in this pairt o Egyp. Thare are extensive thorn palm, acacia, buffalo thorn an jujube forests in the oasis surroondin the modren toun o Kharga. Mony remnant wildlife species inhabit this region. The caipital o the oasis wis Hibis, cried in Arabic al-Maimun time an aw. The admeenistrative centre o the oasie wis probably aye in the Dakhla Oasis. In 1958, Kharga, became the caipital o the province o al-Wadi al-Jadid (New Valley Govrenorate), which an aa includes the Dakhla an Farafra oases. The valley awes its economic importance as a stoppin pynt on various caravan routes frae Libie an the Sudan. 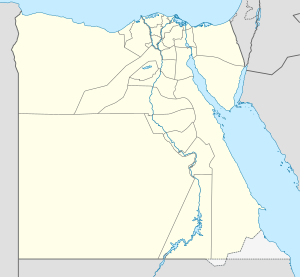 At the same time it is a supplier o agricultural an mineral products, new at least syne the auncient Egyptian empire. Cairt sheet showin Kharga Oasis. The Darb el-Arbain tred route, passin throu Kharga in the sooth an Asyut in the north, wis a lang caravan route runnin north-sooth atween Middle Egyp an the Sudan. It wis uised frae as early as the Auld Kinrick o Egyp for the transport an tred o gowd, ivory, spices, wheat, animals an plants. The maximum extent o the Darb el-Arbain wis northward frae Kobbei, 25 miles north o al-Fashir, passin throu the desert, throu Bir Natrum an Wadi Howar, an endin in Egyp. Aw the oases hae aaways been crossroads o caravan routes convergin frae the barren desert. In the case o Kharga, this is made parteecularly evident bi the presence o a chain o fortresses that the Romans biggit tae pertect the Darb el-Arbain. The forts vary for size an function, some bein juist smaa ootposts, some guardin lairge settlements complete wi cultivation. Some wur instawed whaur earlier settlements awready existit, while ithers wur probably foondit anew. Aw o them are made o mud bricks, but some an' a' contain sma stane temples wi inscribed waws. Describit bi Herodotus as a road "traversed ... in fowerty days," the Darb el-Arbain became bi his time an important land route facilitatin tred atween Nubia an Egypt. For this reason, it is whiles referred tae as the Fowerty Days Road. As pairt o a caravan proceedin tae Dafur, the Inglis explorer W.G. Browne paused for several days at Kharga, leavin wi the rest o the group on 7 Juin 1793. At the time a Gindi wis stationed at Kharga, "belangin tae Ibrahim-bey-el-kebir, tae whom those veelages appertain; an tae [this offeecial] is entrustit the management o wha relates tae the caravan durin the time o its stay there." Native Khargans belang tae the relatit Beja ethnic group. Thay speak thair awn Afro-Asiatic leid, tho Arabic is the dominant tongue. A regular bus service connects the oasis tae the ither Wastren oases an tae the rest o Egyp. A railwey line Kharga - Qena (Nile Valley) - Port Safaga (Red Sea) haes been in service syne 1996. The Temple of Hibis is a Saite-era temple foondit bi Psamtik II, which wis erectit lairgely bi the Persians (Darius the Great an Darius II) durin thair rule ower Egyp ca. 500 BC. It is locatit aboot 2 kilometres north o modren Kharga, in a palm-grove. Thare is a seicont 1st millennium BC temple in the soothren maist pairt o the oasis at Dush. An auncient Christian cemetery at Al-Bagawat an' a' functioned at Kharga Oasis frae the 3rd tae the 7t century AD. It is ane o the earliest an best preserved Christian cemeteries in the auncient warld. ↑ Jobbins, Jenny. "The 40 days' nightmare," in Al-Ahram, 13-19 November 2003, Issue No. 664. Published in Cairo, Egypt. ↑ Burr, J. Millard and Robert O. Collins, Darfur: The Long Road to Disaster, Markus Wiener Publishers: Princeton, 2006, ISBN 1-55876-405-4, pp. 6-7. ↑ Richardson, Dan; (1991). EGYPT: the Rough Guide. Harrap Colombus Ltd, Kent. Page ii. Wikimedia Commons haes media relatit tae Kharga Oasis. This page wis last eeditit on 10 Mairch 2018, at 19:56.